M·A·C Cosmetic’s Ice Parade collection is a 2011 limited edition collection which includes 3 variations of Eye shadow x6 (6 Snowglobe Eye Shadows/Cool, 6 Snowglobe Eye Shadows/Warm and 6 Snowglobe Eye Shadows/Sultry). Each palette includes 6 shades of eyeshadow that are contained in snow globe-inspired compacts. It is about US$38.00 (Php1,700.00) for 0.21 oz. I bought this last year and decided to share with you this Sultry Snowglobe Eyeshadow Palette which is one of the 3 palettes available back then. This palette includes 3 limited edition colors and 3 permanent colors which you can still buy individually at any M·A·C store. The M·A·C Ice Parade Collection launched late October of 2011 in-stores. 1. Lightfully (Limited) is a sheer baby pink but is icy white with a very little color payoff when you apply. I thought I can use this as a base but this color is kinda disappointing. 2. Trax (Permanent) is a copper/gold shimmered burgundy color. This gives a good color payoff. This is shimmery so this is prone to some fall-out. 3. Fun! (Limited) is a copper color eyeshadow but when you apply as if it's not there. It is a disappointment. I tried a couple of layers but still the color does not payoff. 4. Festive Delight (Limited) is a pretty high pigmented lustre berry eyeshadow. Festive Delight has a sheen finish but not that much so it's not likely to fall-out compared to other lustre eyeshadows. This is the only limited color in the palette that is not disappointing. 5. Black Tied (Permanent) has a velvet finish so it's gives a much softer color payoff than what appears in the palette. It is a chalky black with silver-ish sparkle.It's a little bit matte to me but it does not blend so well when applied like any other matte eyeshadows I have. 6. Shadowy Lady (Permanent) is a blackened burgundy with purple edges and a matte finish. This has a matte finish and is part of the permanent range. I am excited of the few Holiday Collections that MAC launched but I am super thrilled of the Making Pretty Holiday Collection 2012 available on 6th of December 2012 (Online), 13th of December 2012 (North America) and February 2013 (International) at MAC. 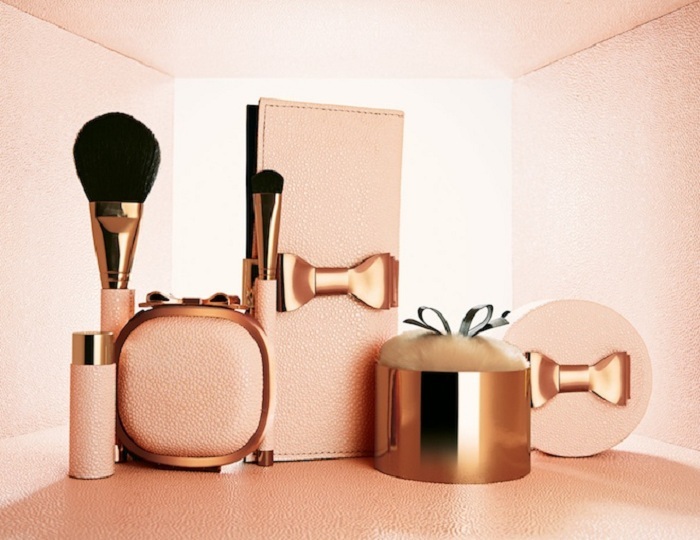 Modern makeup darlings are dressed up in richly textured faux shagreen in a pale dusty pink, detailed with a rose-gold signature bow. Features: Lipstick, Sheer Mystery Powder, Iridescent Powder/Loose. And, for professional results, the Making Pretty Brush Set/Face & Eye with exclusive versions of 136 Face Powder Brush for sculpting, blending, highlighting and 282 All Over Eye Shader Brush for building and blending intense color on the eyelids. I am happy to hear your thoughts!